Paddle Plant is an unusual-looking succulent that grows in a rosette of flat, round leaves. It adds bold texture and form to a succulent dish garden. The gray-green leaves grow to about 6 in (15 cm) long and will become tinged in red when exposed to sun. Mature plants may produce a spike of fragrant, yellow flowers in spring. These South African succulents belong to the Crassulaceae family, an extremely varied group. You'll find Kalanchoe thyrsiflora for sale by many names: Paddle Plant, Desert Cabbage and Flapjack Plant are the most common. Shed some light. Like most succulents, this plant grows best in bright light. It will even enjoy some direct sun. Move it outside for the summer, if you want. Just make the move a gradual one to avoid scorching its leaves. Be sure to bring it back indoors if the temperature drops below 50°F/10°C at night. Keep it on the dry side. K. thyrsiflora is easy to grow in average room conditions, tolerating the dry air of heated homes well. The one thing it doesn't like is soggy soil, so I'd recommend potting it in a terra cotta pot with drainage holes and using a sandy medium, such as cactus potting mix for fast drainage. Repot in spring when it becomes crowded -- but don't over-pot. Use a container that's only slightly larger. Why? Plants grow best when their roots are snug in the pot. Light: Thrives in bright light to full sun. Give the pot a quarter turn every week or so to expose all sides to sunlight. Water: Water thoroughly, then allow top 2 inches of soil to dry out between waterings. Don't allow soil to get soggy or the roots may rot. Avoid getting the leaves wet to prevent rot. Water the potting mix or water from the bottom. Remember to always use room-temperature water when watering your house plants. Humidity: Average room humidity (around 40% relative humidity). Soil: Cactus potting mix. Or mix 2 parts potting mix with 1 part horticultural sand. Fertilizer: Feed quarterly with a cactus/succulent fertilizer. 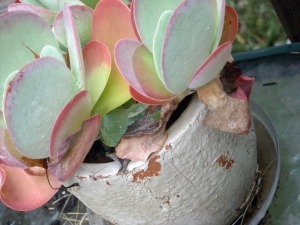 Propagation: Take leaf cuttings in spring or summer and pot in moist cactus potting mix. It's much easier to propagate from seeds, which are easy to find online.